This book contains perhaps the most needed understanding for God's people today. Prompted by the word of the Lord this book analyzes what the Bible says about the most fundamentally important aspects of Jesus' saving work. Precious understanding revealed by a loving God for His people! 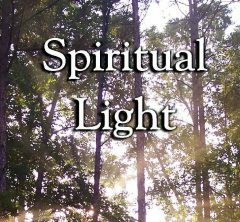 Right click here to download the pdf version of "Spiritual Light". An Important Detail - Where was Christ Sacrificed? may be made perfect in one." Jesus earnestly prayed that the Father would make us all one, and yet God's people are divided by conflicting doctrines and traditions into a thousand different sects. This book is the result of four visitations from the Lord Jesus to me over approximately four years, beginning in the summer of 1975. The first time that the word of God came to me, it was as if I had been sitting in darkness my whole life, without knowing it, and suddenly someone turned the light on. I think you will feel enlightened as well, as you read this book. Prepare for an adventure in faith. © 2008 John David Clark, Sr.